Orbital Sciences Corp.'s first Cygnus cargo carrier pressurized module arrives at NASA's Wallops Flight Facility on Aug. 23, 2011 ahead of preparations for a Feb. 2012 test flight to the International Space Station. A private U.S. rocket company building robotic spaceships to carry space station supplies for NASA has delivered the first of its cargo ships to its launch site in Virginia. 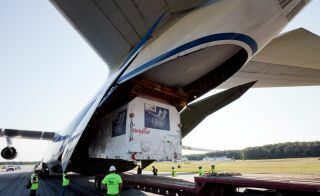 The company Orbital Sciences Corp. delivered the first cargo module for its Cygnus spacecraft fleet to NASA's Wallops Flight Facility on Wallops Island, Va., on Aug. 23 to prepare for a test flight to the International Space Station in February. The Dulles, Va.-based Orbital Sciences is currently working on three major projects simultaneously: readying their Taurus 2 rocket (the booster for Cygnus flights) for its inaugural flight later this year; preparing the unmanned Cygnus cargo freighter for its own demonstration flight; and wrapping up the necessary construction and certification at a new NASA launch site. Orbital Sciences' Cygnus spacecraft consists of two major components, a cylindrical pressurized cargo module designed to carry up to 4,400 pounds (2,000 kilograms) of supplies, and a service module containing the spacecraft's solar panels and propulsion system. The pressurized module was delivered to Wallops from Turin, Italy, where it was built for Orbital Sciences by Thales Alenia Space. In late July, Orbital's chief executive, David W. Thompson, announced that the Taurus 2 rocket's debut flight will be postponed about two months to December to allow enough time to wrap up construction and certification of facilities at NASA's Wallops Flight Facility. The construction process is coming to an end, Beneski said, but the certification process, which is overseen by NASA, is expected to take about six to eight weeks. During this time, Orbital will need to demonstrate that the facilities that have been built work properly and safely. Once the launch facility is deemed ready, the next major milestone for the commercial spaceflight company is the inaugural test flight of the Taurus 2 rocket in December. Orbital's Taurus 2 and Cygnus cargo ship are being developed in partnership with NASA, as part of the agency's Commercial Orbital Transportation System (COTS) program, which is aimed at boosting private sector development of vehicles to carry cargo, and eventually crew, to the International Space Station. NASA retired its 30-year space shuttle program in July, so the agency is banking on commercial spaceships like the Cygnus to deliver American cargo to the space station. The space agency is also supporting a separate effort for new private spaceships to carry astronauts into orbit. Currently, NASA depends on unmanned spacecraft built by Russia, Japan and the European Space Agency to deliver cargo to the space station. The latest Russian cargo ship Progress 44 crashed just after its Aug. 24 launch due to a failure on its Soyuz rocket. Following a successful completion of the Taurus 2's test flight, Orbital will next tackle a demonstration flight of the rocket carrying a Cygnus freighter. This test flight is currently slated to happen in February. "Our first COTS demonstration flight will carry a Cygnus, which will be launched into orbit and rendezvous and berth with the space station," Beneski said. "Actual operational cargo delivery missions will commence about three months later." As Cygnus approaches the station, a sophisticated guidance and navigation system will bring the spacecraft within close proximity to the complex before the station's robotic arm reaches out and attaches the cargo ship to the exterior of the outpost. This requires complex onboard software and rigorous testing, Beneski said. "Since we're rendezvousing with a manned outpost, [Cygnus] has to be very, very robust in terms of its design and its performance," he explained. For Orbital, their nearly 30-year history of building commercial satellites has helped speed up these efforts. "It's all being done in the same facility where we built commercial satellites," Beneski said. "The fact that we are one of the world's leading satellite manufacturers before we even started on Cygnus has definitely helped us a lot in designing and developing a new spacecraft to carry cargo to the space station."